Kāpiti artist Jill Studd and her writer husband Derek Shulz had a productive stay in Whanganui as Glasgow St artists in residence last month. "I've been working on a series called Wild Gardens consisting of watercolours and drawings," says Studd. "I began because of concern about the disappearance of our insect life and the use of garden sprays, particularly - neonicotinoids [neuro-active insecticides]." The series promotes wild gardens as environments where bees, butterflies and other insects can flourish and achieve a natural balance. "It was rewarding to find that visitors to the show were aware of the problem and were hard at work keeping their gardens free of poison." In Whanganui, she began collecting information for further work with a particular focus on Castlecliff. "It was good to talk to people who know this area and are concerned to preserve its special dune land qualities." Studd took photographs and made many sketches and paintings which she will use for future work. "We revisited Whanganui heritage areas with which we are very familiar - Bushy Park, Bason Reserve and Virginia Lake." The couple also took advantage of the Whanganui Summer Programme and joined Colin Ogle's nature walk around Pakaitore and Pukenamu gardens looking at the trees. "I did work in this area in the 1990s so it was pleasant reconnecting with it," says Studd. "I collected leaves and debris and worked on new paintings in a museum-style format." Shulz meanwhile completed a new book of poetry, wrote a long essay, and continued a lengthy nonfiction project. One of his poems Piki is a homage to the couple's old Whanganui friend Piki Takiari from Kaiwhaiki. "We had a very enjoyable and productive stay at Glasgow St Arts Centre," says Studd. "It was especially pleasant catching up with old friends and colleagues." Studd graduated from Canterbury University Ilam School of Fine Arts in 1972. 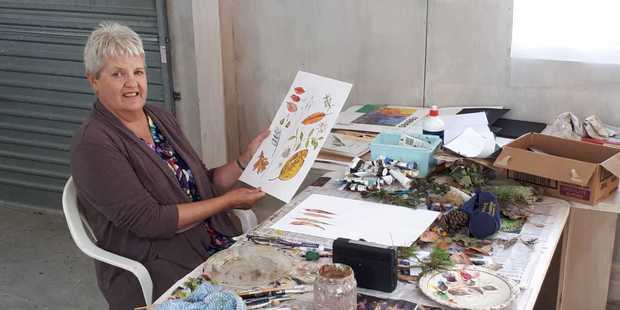 She has been awarded five QE II Arts Council and Creative New Zealand grants, held several artist's residencies and been a fulltime artist since 1987.